If you’ve read our bios, you know that Oli is the chef and that I love to cook, share and explore world cuisines and fine wines. My daytime job, as they say, is medicine. Early in my career I had the pleasure of working with a marvelous woman named Eleanor. There were only the two of us in the lab and we instantly formed a bond. Eleanor had an amazing green thumb and it was from her that I learned everything I know about growing, maintaining and propagating plants. People from all over the hospital would stop by our lab and take a break in our “green room”. Lush plants of all sorts from ivy, to african violets to exotic tropicals were always in bloom thanks to her constant love and attention. It was truly a peaceful respite from sometime stressful days. To this day, the one thing I could never understand about Eleanor was how on earth she could eat cottage cheese and fruit for lunch every single day of the year. Yes! Every day without fail, it was cottage cheese for lunch. Only the fruit changed with the seasons. In the summer fresh tomatoes or cucumbers from her ever-blooming garden occasionally replaced the fruit. So you can imagine my surprise when she announced one day that she had been very busy the prior night preparing finger food for a party she and her husband were hosting that weekend. (Hmmmm. . . cottage cheese and what else? I lovingly thought.) I’ve forgotten the menu, but I do remember my jaw dropping when she told me what she was serving. Cottage cheese was nowhere to be found among the many delectables. The cheese on this menu was Greek feta and there was nothing plain about it. 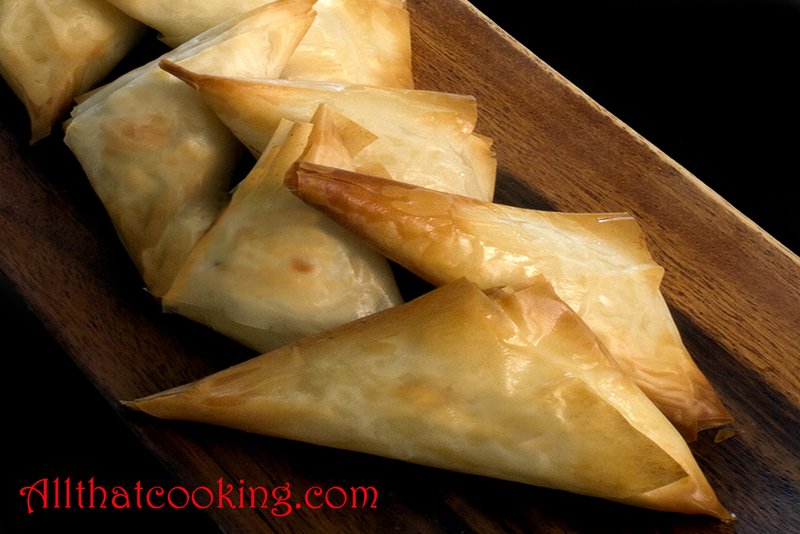 She wrapped it in butter drenched leaves of filo dough and folded them into turnovers. She promised to bring some in for me, but they were such a hit at the party that she was unable to rescue any. She did share the recipe and I’ll tell you that they are still a hit. At Oli’s going away party a few weeks ago friends proclaimed them to be irresistable. People frequently tell me that filo dough intimidates them. It’s not that hard to work with. I think the trick to working with filo is in its description. My friend Carole described filo beautifully: “It’s like an autumn leaf”. She’s right. If its too dry it crumbles like a dry autumn leaf. If its too wet its mushy. When its perfectly pliable its just right. Filo is very forgiving. If it rips, just patch it with another piece of filo. It takes a little patience and practice to work with filo, but it is not that difficult. The directions on the back of the package are quite helpful. Now that my herb garden is lush with basil, two types of oregano, dill, parsley, chives and thyme, I’d throw a handful of herbs into the cheese mix. Come on – give them a try. Make friends with filo! You can find filo dough in the frozen food section of the grocery store. Thaw in the refrigerator before using. 1. Place cream cheese and feta in bowl of food processor. Process until well blended. 2. Add egg and 3 tablespoons melted butter. Process to combine. 3. 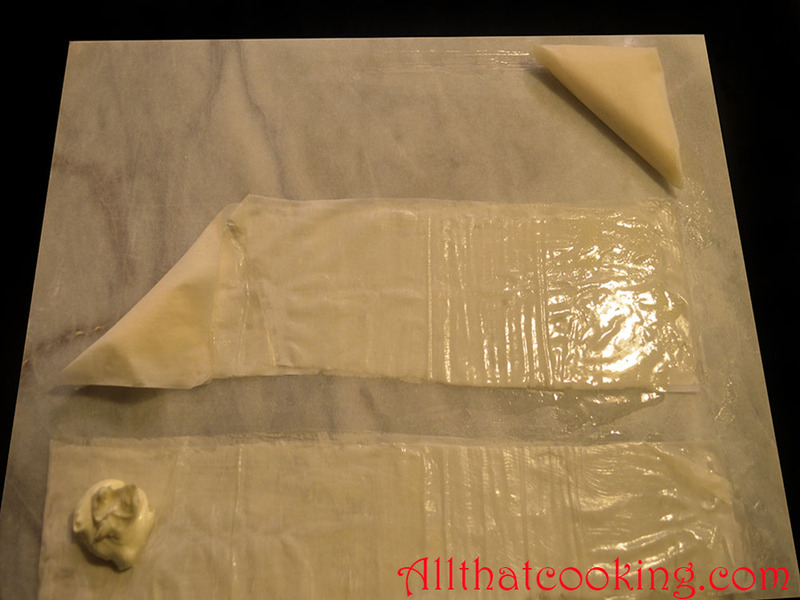 Place 2 leaves of filo dough on clean, flat surface and brush lightly with melted butter. 4. Cut dough lengthwise into 2 1/2 to 3-inch strips. 5. Put about 1 teaspoon of cheese filling near the end of the cut strip. 6. Diagonally fold up bottom corner of dough to cover filling. Continue to fold as you would fold the flag in order to finish with a triangular-shaped turnover. 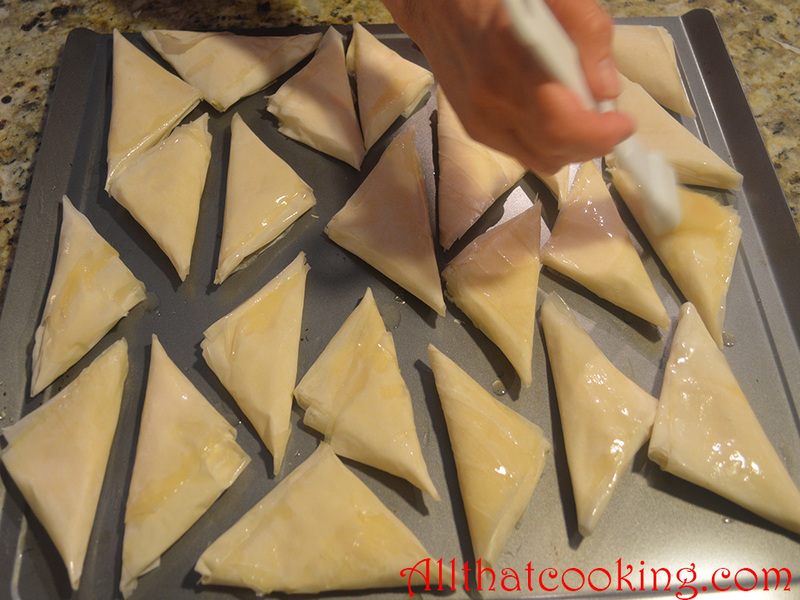 Don’t fold too tightly or turnovers will burst as they are baked. 7. As you complete each turnover, place it on an ungreased cookie sheet, seam side down. 8. Brush each turnover with melted butter. Can be frozen after baking and cooling. When reheating, watch carefully. You may need to brush with more melted butter. Gallery | This entry was posted in Appetizers and tagged cheese turnovers, Feta cheese turnovers, Feta Filled Filo Turnovers, Feta Filled Phyllo turnovers, Filo dough, Greek Feta Cheese, phyllo dough. Bookmark the permalink. It’s a melt in your mouth buttery, delicate crunch. Hmmm, can a crunch be delicate?? It looked so good and ! and i gave it a try. Oli told me that you two talked about your experience. You were pretty adventuresome to make your own dough! It sounds like the dough was heavier than filo and that might have been the issue. If you would like to try again, pick up some filo dough from the refrigerator or freezer case in the grocery store. I’ll wager that you will be pleasantly rewarded! That’s the spirit! Throw in a handful of fresh herbs this time if you can. And let me know about this adventure. Having eaten as many of these as I could at Oli’s “Fare Well, Friend” gathering, I guaranteed that, like Eleanor, Gina would not be giving any away the next day. That so few ingredients can produce something that disappears so quickly is a beautiful trick. The reality is that cheese and butter and a melty crunch are a combination which tempts with the “betcha can’t eat just one” taunt, and it’s impossible to resist that challenge. As for constructing these little babies: filo has gotten a bad wrap rap; it’s pretty easy to work with. Take it on! It is so worth it. Bless your heart my friend! I love anything wrapped in a dough. YUM!